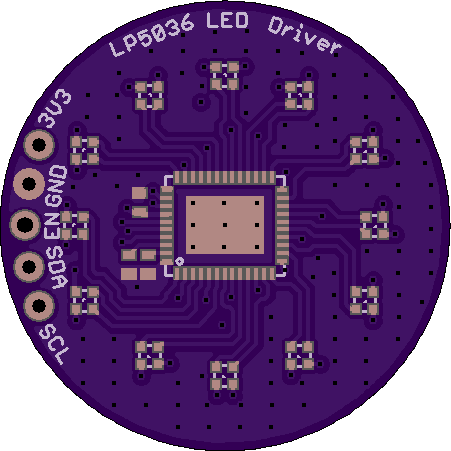 4 layer board of 0.84 x 0.75 inches (21.3 x 19.1 mm). Uploaded: April 6th, 2019 04:51. Not quite so gigantic test board for TI's LP5036 RGB led driver….and get the rgb led positions right. Not quite so gigantic test board for TI’s LP5036 RGB led driver….and get the rgb led positions right. 4 layer board of 0.90 x 0.90 inches (22.9 x 22.9 mm). Uploaded: April 5th, 2019 06:32. 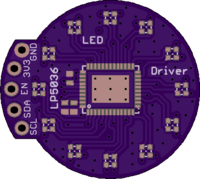 Test board for TI's LP5036 rgb led driver. 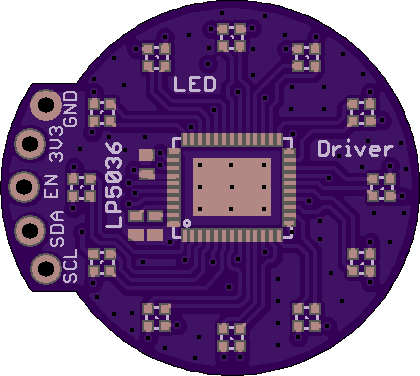 Test board for TI’s LP5036 rgb led driver. 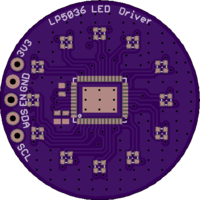 4 layer board of 0.71 x 1.71 inches (17.9 x 43.3 mm). Uploaded: April 4th, 2019 04:22. STM32WB55CG (QFN-48) BLE 5.0 development board with pcb antenna, SMPS circuitry, USB hot-detect, battery voltage monitor, 21 GPIOs, and tag connect. Intended programming mode is via USB connector using Arduino IDE, but SWD port also exposed for ST LINK V2. Fixed VDDA trace, VDDSMPS power, and USB pin. Uploaded: March 19th, 2019 02:01. STM32WB55CG (QFN-48) BLE 5.0 development board with pcb antenna, SMPS circuitry, USB hot-detect, battery voltage monitor, 21 GPIOs, and tag connect. Intended programming mode is via USB connector using Arduino IDE, but SWD port also exposed for ST LINK V2. Uploaded: November 16th, 2018 22:40. Master LSM6DSM and slave LIS2MDL and LPS22HB (Mode 2). 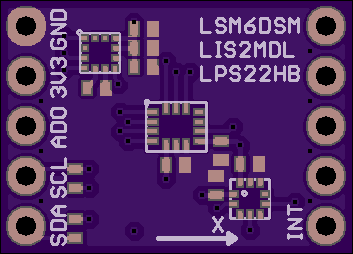 Used for multiple LSM6DSM on the same I2C bus.